Free of any sales motives, I can help you choose the right authoring tools and systems to create technical documentation, in particular software documentation (user manuals, online help). In addition to consulting, I can also assist you hands-on in creating the required templates and in setting up the production process within the chosen tools. Do you need an authoring tool to write software documentation (user manuals, online help) yourself? Or are you no longer fully satisfied with your current help authoring tools or online documentation tools? If it turns out later that your decision was wrong, things will become expensive: You will have to make new investments in other software, in the repeated training of staff, in the repeated setup of templates and workflows, and in the conversion of documents that have already been created. With many years of experience in planning and writing technical documentation, I can systematically analyze your specific requirements. Based on these requirements, I can then present a preselection of tools that meet these requirements as best as possible, and I can explain the specific advantages and disadvantages of each solution. This gives you a well-founded basis for your decision. I’m free of any sales motives for a specific tool. Therefore, my advice will be absolutely neutral and vendor-independent. For the same reason, I won’t procure any tools for you. To buy a specific tool, you will need to contact the maker directly. In addition to consulting, I can create the required templates and set up the workflow within the chosen software. 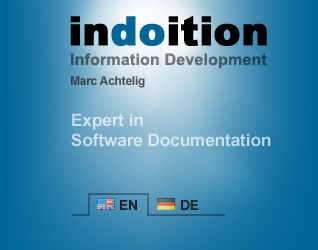 Technical documentation for more than 25 years. Various publications and presentations on technical writing, technical communication, and software user assistance. Member of tekom, the German professional organization for technical communication and information development. Do you prefer writing your documents in-house? My books can provide the know-how.